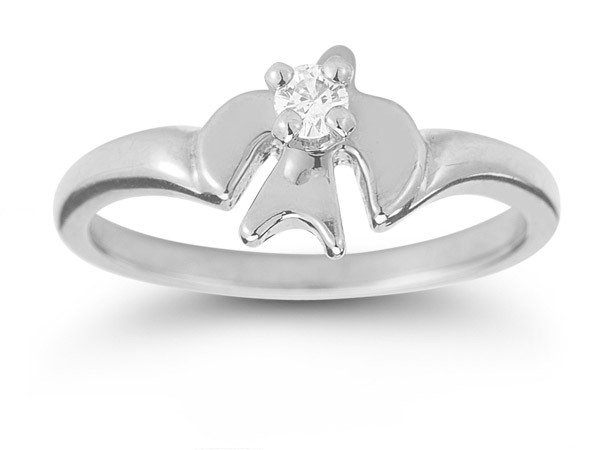 Get a fresh perspective on faith with this Holy Spirit Dove Diamond Ring offered by Apples of Gold. A soaring dove symbolizing the Holy Spirit takes center stage in this moving piece of jewelry. Secondary to the dove is the single, bright white diamond that rests within its wings. This touch of sparkle is perfectly complemented by the premium 14K white gold that is used to craft the dove piece as well as the band, each of which are polished to shine. Apples of Gold Jewelry guarantees the Holy Spirit Dove Diamond Ring in 14K White Gold to be of high quality and an authentic engagement ring with real diamonds, as described above.